“It was seen as a risk for our reputation,” Professor Frank Messner, Helmholtz UFZ’s head of staff said stiffly over the phone from his offices in Leipzig. The HAI had been tasked with upgrading bitumen and lignite coal to reduce energy consumption, and finding ways to deal with overspill from the tar sands industry such as ‘tail ponds’- toxic lakes that now cover up to 176 square kilometers of Alberta. But in reply to a written question from the German socialist MP Frank Schwabe, a statement from the country’s education and research ministry on February 20 said that a moratorium had been imposed on collaboration, pending an independent assessment into its environmental bona fides which will conclude in June. “The assessment evaluates whether a project conforms to sustainability principles,” Thomas Rachel, the education and research minister said. The suspension of research ties follows intense debate within Germany’s scientific and political communities, and will not go unnoticed in Ottawa. “It’s a clear signal that Canada’s energy and climate policy is not accepted by the international community, especially Germany,” Messner said. The EU is inching forward plans to assign fuel from the controversial tar sands a high-polluting tag under its Fuel Quality Directive, which mandates a 6% decarbonisation of Europe’s transport fuels by 2020, as measured against a 2010 baseline. Canada has the world’s third largest crude reserves – after Venezuela and Saudi Arabia – overwhelmingly in the form of tar sands. Mining the sands currently involves the use of huge amounts of water and chemical solvents to extract oil from bitumen, a viscous substance found in sand and clay. The extra energy required by the process of steam injection, strip mining – removing large stretches of overlying soil – and refining is a turbo-booster to CO2 emissions. Canada’s tar sands deposits contain twice the amount of carbon dioxide emitted by global oil use in human history, according to James Hansen, the head of NASA’s Goddard Institute for Space Studies. “If Canada proceeds, and we do nothing, it will be game over for the climate,” Hansen famously wrote. It would elevate global temperatures to levels not seen since the Pliocene era, more than 2.5 million years ago, he added. Environmentalists say that by 2020, a planned expansion in Alberta’s tar sands operation would sprawl to an area the size of Austria, the Netherlands and Switzerland combined. A 2011 report commissioned by the EU from Adam Brandt, an Assistant Professor at Stanford University, found that the lifecycle emissions of fuel from tar sands – also known as oil sands – were between 12-40% higher than conventional crude, with the most likely barrel being 22% more carbon intensive. On paper, this should still be enough to have it assigned a high-polluting default value, albeit by slightly less than the 107 grams of CO2 per megajoule – compared to 87.5g for conventional crude – in the EU’s Fuel Quality Directive. But Canada’s interpretation has been different. “We ask why the oil sands from Alberta would be singled out and unfairly targeted, especially if the intent is truly about climate change and reducing emissions in the EU,” McQueen said. Canada has previously threatened to launch a suit against the EU at the World Trade Organisation if it proceeds with the Fuel Quality Directive as planned, and has raised the issue in the context of a planned $20 billion EU-Canada Free Trade Agreement. Environmental and climate science budgets have been axed, and one of the world’s top Arctic research stations for monitoring global warming has been closed. As such, environmentalists welcomed the pushback from Germany. “A number of high level EU decision makers have stated that the Canadian lobbying effort goes beyond what is considered acceptable,” Darek Urbaniak of Friends of the Earth told EURACTIV. The EU’s Fuel Quality Directive requires that energy providers reduce by 6% the greenhouse gas emissions of the fuel they put on the market, through methods such as reducing flaring or increased use of biofuels. On 4 October the European Commission voted for a review of the directive which assigns a default value 107 grammes of CO2 equivalent per megajoule (CO2eq/MJ) for oil produced from tar sands, despite Canadian protests. This figure is higher than that assigned for other crude oils, 87.5g CO2eq/MJ average, because oil extraction from tar sands is more carbon intensive. EURACTIV understands that a fuel directive impact assessment currently under consideration by the EU outlines several options for measuring and reporting greenhouse gas emissions, some new. These include: one non-discerning and regularly updated greenhouse gas default value for all fossil fuels; an average default value for each fuel, as at present; a Dutch proposal for default values averaged at national levels; and the imposition of default values which allow for reporting emissions from conventional and unconventional oil alike. We must all look in the mirror and face up to the fact that we are the consumers of this filthy stuff. Write to your car company demanding a competitively priced electric car. Carpool or take public transit. If you use oil to heat your house, switch your furnace to electric and insulate-insulate-insulate. Buy local food when ever possible and ask your grocer to mark where foods come from. These are all things we can do to reduce the demand for oil. When demand drops, prices fall and the tar sands loose their profitability. I have been proud of the things Canada stood for all my life, all 64 years of it. Over the last 6 years, watching Harper dismantle our rights, sell off our national parks that belong to the nation not to the Conservatives, and remove protection from lands and water. My whole family were homesteaders in the late 19th and early 20th century, all the adult men and my mom volunteered for WW2 and served in Europe. We used to be a decent country and, unless we get rid of these Corporatists we will never be again. I praise Germany for behaving as Canada used to: morally and intelligently. I hope every good nation does this until Canadians turn off the hockey and realize we did not get our rights by sitting on our behinds. It was a fight to get rights and protection. There is no fight to save the nation. Speaking as a Canadian, please, please don’t accept our oil. So many of us don’t want to develop the tar sands, but there is no stopping the Conservative Government currently controlling Canada. The government does not have the majority of support of the people of Canada, but there is currently little we can do to stop them. I think the best way to stop Canadian oil is to have other countries agree not to do business with us. Thank you Gavin. Well said. I would encourage all of Canada’s customers for oil to buy elsewhere. Canada is no longer deserving of respect or support. I am a fifth generation Canadian whose great grandparents and grandparents and all their friends came to build lives and a compassionate world. I loved this nation and was proud of it. We protected the land and now the government is wilfully removing protections for the land and the people. I taught Canadian History in high schools. As far as I am concerned our current government, elected by seats not votes, has destroyed every good thing we stood for. I was raised to protect the land and care for the people. If our voters bring this leadership in again, Canada as we knew it will be dead. Thank you Germany! It is insane here how the government is trying to pretend the oil sands are clean, and needed to keep Canada’s economy going. They’ve gone as far as to call the tar sands literally green! The TV and other adverts supporting the sands are outrageous and outright lies, and of course not to mention the number of scientists, that as your article mentions, have been muzzled, and the number of research facilities have been lost – with years of research (documents, data, etc) destroyed. We need the world to stand up to this, as much as Canadians need to stand up to it internally. It is embarrassing as well how this government is playing the poor victim internationally. From someone living in Alberta,the province where the oil sands are…thank you Germany. Seriously…maybe now more of the world will take notice of this. As for anyone else that reads this,please pass this on and let others know about it. There are better ways,though trying to convince the people stuck in the petrol rut is tougher than ever now days. Bravo to Germany, and also the EU. Perhaps the Harper Government’s hubris will finally get the better of them. Gavin, I also applaud the German institute’s move and appreciate your sentiment about personal action – but some more wisdom is needed about what to do; the problems are harder than that. When you switch to an electric car or furnace (at considerable environmental impact for that purchase of new materials), you may just be switching to burning coal instead of oil. It depends. On the tar sands, full-lifecycle CO2-equivalent GHG intensity must be held to LESS than conventional crude, or we’re going backward. This will require CO2 capture and storage. Thank you Germany. I hope this withdrawal sheds light on the situation to the rest of the world. Boycott this filth and tell Canada “No”. I am a proud Canadian who is shamed by the short sighted and reckless actions of our current government. As a Canadian, all I can add to all the above comments is ‘Amen’! This is an environmental catastrophe waiting to happen! The far reaching effects of this abomination are without precedence. Thank you, Germany. Hoping that your decision will influence others to take a close, hard look beyond the ‘instant gratification’ of this filthy project. 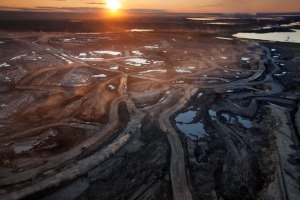 I applaud Germany for its stand to pull out of Canada’s Tar Sands fiasco. As a Canadian citizen living abroad, it pains me to see how far my country has fallen due to the person that was put in office. Canada’s environment, wildlife and its citizens are suffering. So, thank you Germany for taking the right action! Hopefully the Canadian federal and Alberta provincial governments will now pay attention! Because they certainly haven’t been listening to Canadians!! I am Canadian, of German ancestry generations ago. I also worked in Fort McMurray Alberta for near 4 years during which time I tried to convince Syncrude to use my system at their site. This is what I offered them to install on their “Industrial Diesel Engines”. “I have a pollution reduction design to “Convert” any existing internal combustion engine to use 25% less fuel, emit 100% less “Acid Rain” producing GHGs, and make use of 90% of the ‘Heat energy’ discarded as waste by conventional internal combustion engines. Add onto which the massive impact this reduction in emissions in reducing World Wide Air Pollution it would have globally, and it makes you wonder why we aren’t using it already. I believe T. Boone Pickens hit the nail on the head in the 2008 election. The USA has 3x the Natural gas deposits than Saudi Arabia has oil. It is easy to transfer petrol cars to this fuel. It burns much cleaner than petrol, also has 130 octane. With tide and wind, North america can be energy independent. Tar sands are very dirty, they may be able to develop technology in the future to burn and mine it cleaner-but it is clearly the wrong direction. The problem I see is that no matter how clean we become, China, India, Mexico, etc., need to employ these same energies to their production, otherwise, it just cancels our gains out. Germany, of course, made this move out of self preservation. However, it was the ethically correct one to make. I, too, am 4th generation Canadian on the prairies and am heartsick over these past few years’ developments in Alberta. What many people don’t realize is that tar sands extraction is destroying Alberta’s Northern water system and global warming is diminishing snow packs in the South, so Alberta will be short of clean water within a few decades. It’s a race by the oil companies to pull the tar of the ground before the Athabasca River is diminished and the public catches on. The “Combustion Science” is basically the same on a mixed oil and gas “Weed Eater” or on an “Ocean Going Bunker “C” Crude” burning container ship or a locomotive. Since this system runs on the “Heat Released” by any and or all of them, and will do the same “SCRUB THE EXHAUST CLEAN of Water Soluble GHG’s” just like “Acid Rain” does out of our skies, only much more effectively, and while the gasses are still in the exhaust system. Ken G I think you can trust people who receive this kind of news to get that we know enough to check if a change is to a green solution or to coal or any other hydro carbon. Many of us have likely been aware of the problems and working on them since the 1970’s. No one who is serious thinks we can leap from one technology to another over night. We are saying we need to phase out the polluters as we introduce more Green, as they are doing in some European nations.Instead of the millions of dollars spent on propaganda about the Tar Sands why not develop alternatives? Why open the Tar Sands at all when Alberta is already a wash in oil and gas wells? The comments here have renewed some of my faith in the intelligence and decency of some Canadians. It’s disappointing to see your “us vs. them” tone. But indeed – though not Canadian – I’m part of your “us” since I’ve been working on environmental problems since 1969. I’m glad you appreciate the complexity and challenge – as clearly not all do. I appreciate the complexity because I make the effort to learn and to keep testing my educated opinion against opposing views. I learned, as a History student that everything should be checked for bias including my own opinion. I learned how to analyze critically. I know everything is complex. Occam may be a good barber but in our world what is obvious to one interest group is not the same as what is obvious to another interest group. Studies students to think not merely to memorize. I encouraged them to disagree using logic and facts with proofs. This is not what was done in the high school my son attended in NJ. I had to debrief many times regarding the so-called facts and the attempts to put him off questioning the teachers and the administration. This lack of intellectual skills and the apparent lack of awareness that one should test one’s opinions is rampant and has the US in a bad situation. I am hostile to anyone who condones any practice that submits us to needless pollution of our earth, water or air. As someone that has read all the posts offered I can only come to the conclusion that we still have a long way to go before this green brainwashing is conquered. The planet is fine but you fine folk really need help. Alas, Canada has become a nation of bystanders watching the Corporatists take over. It has been happening, incrementally, for years. Those of us on the Left have protested to no avail. We don’t just need help. We need citizens with backbones willing to lift their faces from the trough. All the things I was proud of have been dismantled by the Prime Minister and his toadies. I see no hope that Canadians care enough to reinstate all the protections and services that have been taken away in recent years. Few bothered to stand up and protest. Like the US, Canada is a nation of money grubbers spitting at the vulnerable and the poor and welcoming foreign ownership of our formerly protected lands and resources. It was a grand experiment. I was lucky to be born here. My son is unlucky to have been born here. I should have got my British Passport and fled years ago. Well, it’s apparent that the NDP/CBC crowd has done an e-mail blast to rally the troops to condemn Canada’s Conservative gov’t. Never mind that we have a stable economy, quite low unemployment and that the vast majority of people are quite happy with our current governance. Environmentalism CAGW), and socialism are just two faces of the same coin, both built on false premise and blind faith. Both have the same objective – the destruction of free markets and free will, enslaving people to the socialist ‘intelligentsia’ and lower standards of living. Quoting frauds such as James Hanson is a quick tipoff, his ‘chicken little’ bleatings have destroyed any reputation he might once have had. I’m surprised there wasn’t a quote from Michael Mann, but that might have stretched the credulity of the article a tad too much. We in Canada can watch quite comfortably as our European neighbours face economic collapse, energy shortages and eventually rioting in the streets, all due to the stupidity of their collectives of enviro-socialists and pandering politicians. You don’t want our oil? No problem. We’ll happily sell it to India, China, Japan or other countries currently dependent on much more polluting coal. It’s a win-win for Canada and the world. We get jobs and tax revenue, while other countries can lower their own emissions by using efficient, clean burning fuels from Canada’s oil sands. I am an Albertan; 4th Generation. I was a socialist in the 60’s and I still am. I am not “rallied” by anyone and never have been. I vote on principle not by who the leader is and certainly not by campaigns. I am, due to a darn good brain (inherited so no cause for pride) and a fabulous education in History with accompanying social sciences, quite capable of making decisions for myself. I have worked almost exclusively in large corporations and on the front edge of software development. I don’t’ just read and spout, little person, I am quite capable of doing all the analysis and research in varying sides of every issue. Your utter lack of education shows. So does your lack of experience in the real world and certainly not in the oil patch where I live and loathe. You are a right wing idiotlogue. You are the kind of person who supports the destruction of everything that made us secure and liked in the world. I suggest for you a superb education in anything that teaches critical thinking and the ability to weed out your bias and that of others. Then get an education degree and teach for a few years; learning how the teenage brain works and how to think on your feet. Learn to teach a humanity or social science and you will have no choice but to learn how to present material in an unbiased fashion: because its the law and the only way to understand what is happening is to carefully and critically examine all the evidence not just your own personal dogma. This is, in fact, a very left wing way of teaching. In the US they tend to teach the facts as the government states them. They do not teach children how to use their brains other than memory and to be obedient. It might be a good idea to look at what is going on in Canada and the US. The US is broken beyond repair and Canada appears to be headed in the same direction. Oil is causing this by manipulating the economy in its favour with the help of the Cheney’s, Bushes, Hapers… I suggest you start doing a variety of different careers, in tandem or sequentially. You will have to get a very good education but it would not be fun if you did not have to learn something new and challenging. There you will, if you are close enough to the top, learn what is going on in each industry and what the executives think of the lower ranks. Among other skills, you should become a business process analyst so you can understand what is and is not working through careful analysis of benchmarks and the facts. I reinvented myself repeatedly and take every course in business and IT that I could. My last job before retirement was IT manager of a very large professional organization in the Oil Patch in Calgary. I helped found this organization over 25 years ago. I also worked in software development in the Financial District of NY. I bother to tell you this when I have no concern for what you or any other uneducated right wing person thinks of me. Frankly, I don’t’ need the respect of the unrespectable. I explain this to let you know that not everyone online is an uneducated child. It appears that you are unaware of what experience and a good education and a life of deliberate learning can do for you. It can help you think for yourself and avoid the pitfalls you are mired in. I was out with a political journalist a few years ago who asked me what experts I read. I said I did not need to read them. He asked me how I could understand the news if I did not read the experts. I reminded him of my education, my age and my career paths. Still, he was offended that I would not believe his stand on the basis of his say so. Journalists are not normally broadly and deeply educated. Neither are you. There you have it folks, the socialist intelligentsia who looks disdainfully upon you as mere troops in the Global Warming financial/political scam they’ve tried to perpetuate upon all of us. It’s not for nothing that it was morphed from global warming to ‘climate change’. Global warming was and is being shown as nonsense, but climate change can be anything deemed ‘unusual’ and attributed to man caused effects. Why I’ve even heard of earthquake frequency being our fault! CalgarySandy is looking down his/her nose at you whether you realize it or not. He/She sees him/herself as part of the ruling elite who will create the brave new world of socialist man, deciding for you what you will learn and how you will live. To suggest that our public schools and universities are shining beacons of unbiased learning is patently absurd. The leftists infiltrated both of these institutions many years ago and it is now more indoctrination than education. There are no ‘free thinkers’ in education and those that exhibit any attempt at such are quickly sidelined or humiliated. It’s toe the party line or suffer the consequences. Hey Sandy, how’s that secular religious dogma working in the real world? “The shock revelation starkly contradicts the core proposition of the so-called greenhouse gas theory which claims that more CO2 means more warming for our planet. However, this compelling new NASA data disproves that notion and is a huge embarrassment for NASA’s chief climatologist, Dr James Hansen and his team over at NASA’s GISS”. So NASA now says that CO2 REFLECTS much of the energy from the sun, rather than trapping it – the primary premise of ‘global warming’. I’m guessing that Principia and perhaps even NASA will now be accused of being shills of ‘big oil’ and promoting a corporatist agenda. Deviation from the party line will not be tolerated! Hmmm. Suddenly the deluge of comments condemning Canada – primarily by self-loathing Canadians – has come to a screeching halt. I suspect it’s not because I’ve convinced them that they’re being played for dupes, but rather that they have the attention and tenacity of a gnat. They make their impassioned and emotional comment and then ho hum, it’s time to move on to other things. American Idol must be on.